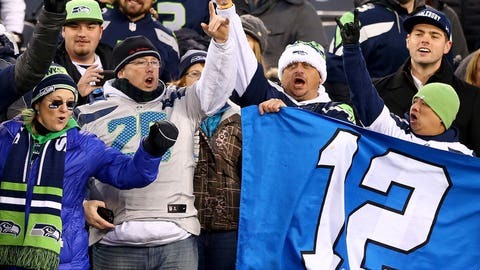 Twelve lucky NFL fans (not necessarily depicted here, though these guys will take the win, too) will be getting hefty payouts from a Seattle car dealership after the Seahawks shut out the Giants. A Seattle-area Chevrolet dealership knows just how important insurance is — promotion insurance, that is. Jet Chevrolet promised 12 people $35,000 apiece in a drawing if the Seahawks shut out the Giants on Sunday, and Seattle, being very good (and New York being very bad), did just that. "This is crazy," said Jim Johnson, one of the owners, according to ESPN. "We never expected that we’d actually be giving away the money." The original plan was to hold the promotion the week before, when the Seahawks played the 49ers. Instead, while working out legal details, the dealership bumped the promo to the following week. This time, the Seahawks faced the hapless 5-8 Giants, who have already been shut out once this season (Week 3 against the Panthers). Jet Chevrolet ran the promotion anyway, and all that’s left is to draw the names of the 12 lucky fans. Johnson said 20 people bought cars during the promotion period this week, with each of them receiving 100 entries into the drawing, and another 12 people entered the drawing without buying a car (with the dealership required to open the drawing to everyone). Patriots have third-most 'unstable' fan base? The dealership had a scoreboard predicting the final score of Sunday’s game as 24-0, Seattle. What luck.